Ever since I was able to go to a pasta making class, I've wanted to try making some gluten free pasta. I was really feeling pierogi's so I decided to give it a go. I spent awhile looking up recipes and finally decided to use bits and pieces of a bunch of recipes to create my own. These came out really great and Nate loved them which is the real test in our house for Gluten free recipes. I tend to be a messy cooker. I get all my ingredients out and go nuts. You're going to start by getting the sweet potato cooking before you do anything else. I microwaved mine but you can boil or bake it as well. By cooking it first you give it time to cool down so you can work with it later. Then you are going to work on the dough. Your are going to first combine all the dry ingredients together in one bowl and the wet in another. Once both are well mixed you will combine and mix until your dough forms (I like to used my hands to mix everything) and then knead it for a few minutes. 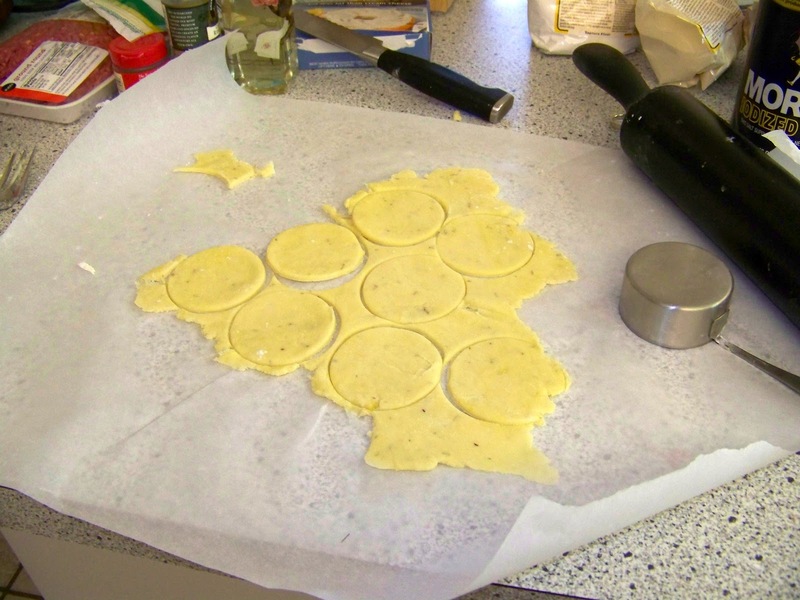 Cut your dough into quarters and roll each section out into thin sheets. You then can use a cookie cutter (or I used my measuring spoon ) to cut circles out of your dough. 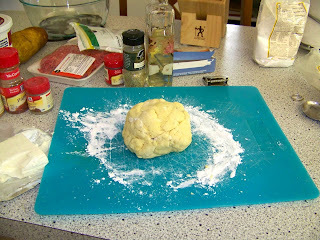 You do this with all of your dough and set the circles off to the side. 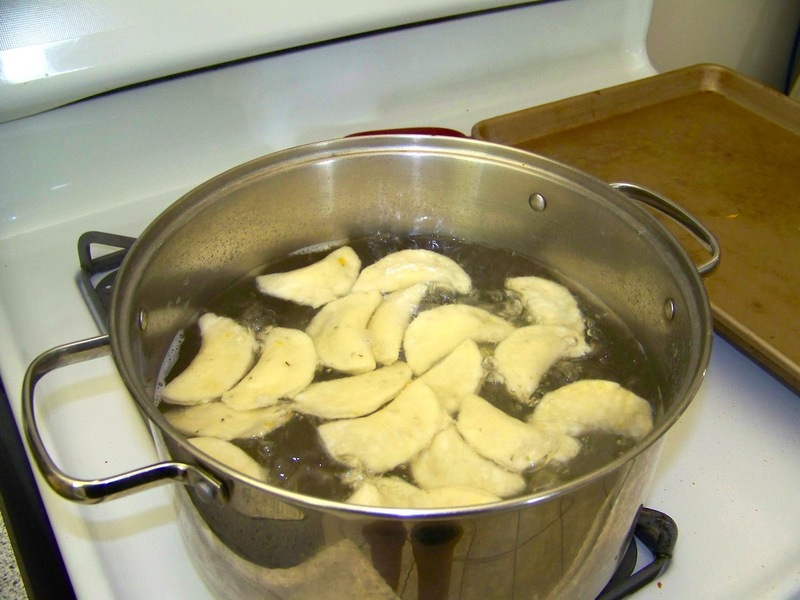 At this point you can get a big pot of water boiling with some salt in it so it will be ready to cook your pierogi's. Then it is time to make your filling. 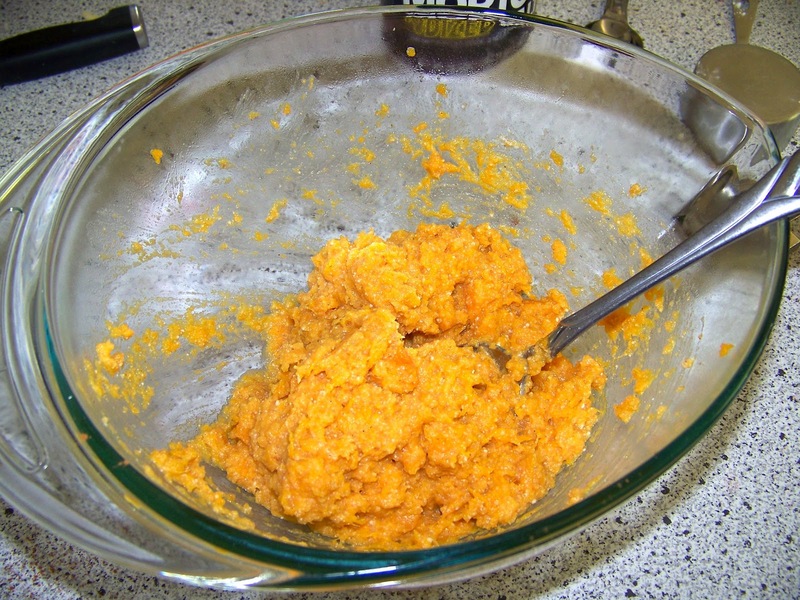 Your sweet potato should be cool so you can scoop the meat out of the skin. Add the rest of your filling ingredients and mix until combined. 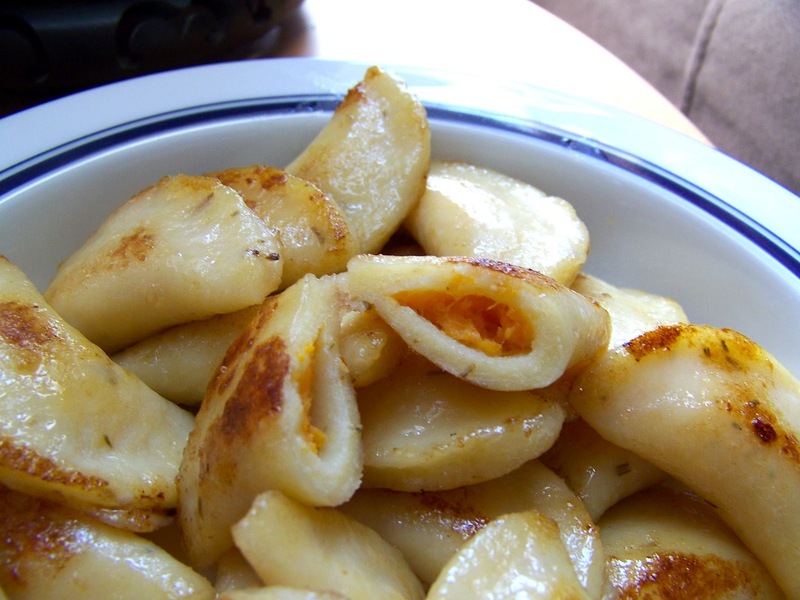 Put a little dollop of filling in the center of each dough circle (you don't want to use too much or else the pierogi won't close). Dip your finger in water and moisten half of the circle of dough. 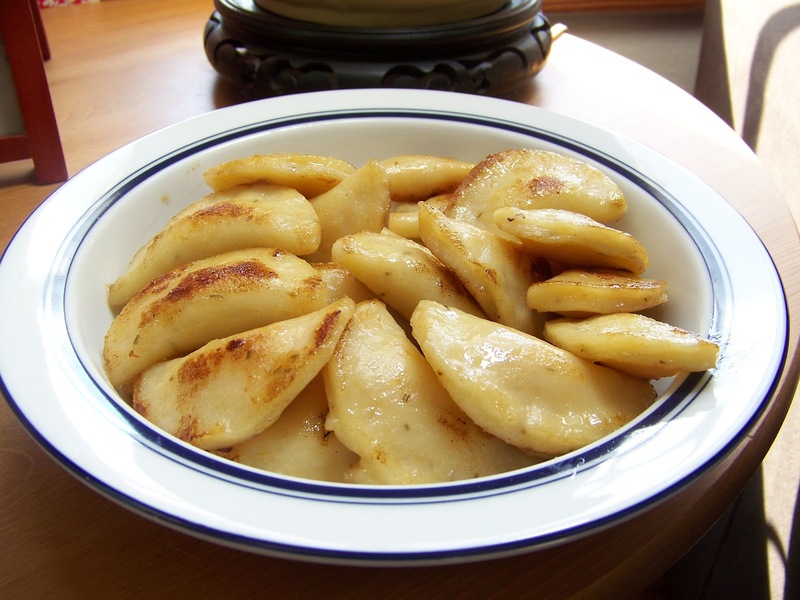 Fold the dough in half and pinch the wet and dry sides of the dough together until the pierogi is fully closed. Drop the pierogi's in the boiling water. Once they float to the top fo the water cook for another 5 minutes. 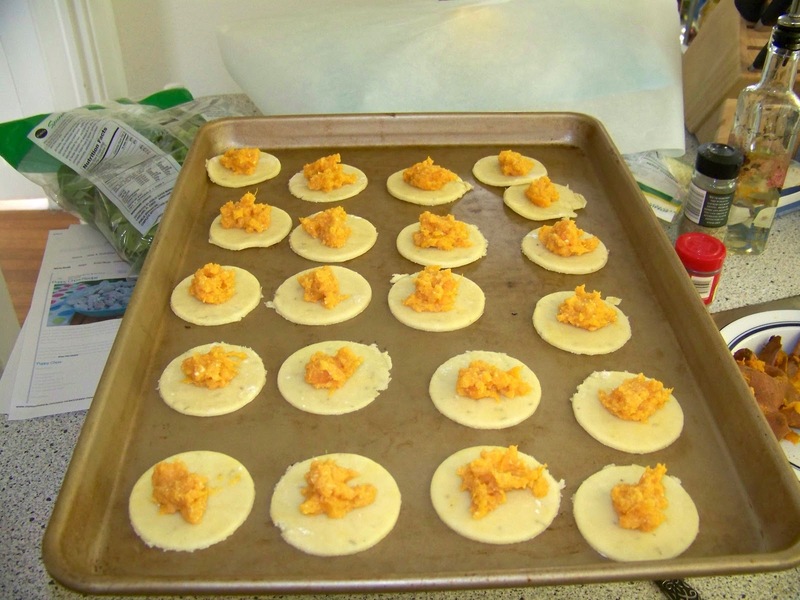 Scoop the pierogi's out fo the water and cool on a cookie rack so they dry out. 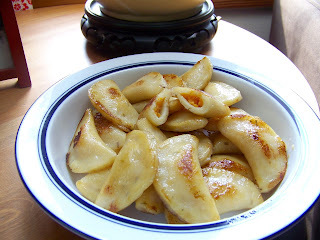 You can cook these in any sauce that you like but I just sautéed mine in a little butter and brown suger until the pierogi's were nice and browned. The combination of the browned sugar with the filling was pretty amazing. Serve while hot and Enjoy! I am so excited for this recipe! We just found out that my daughter is allergic to wheat. 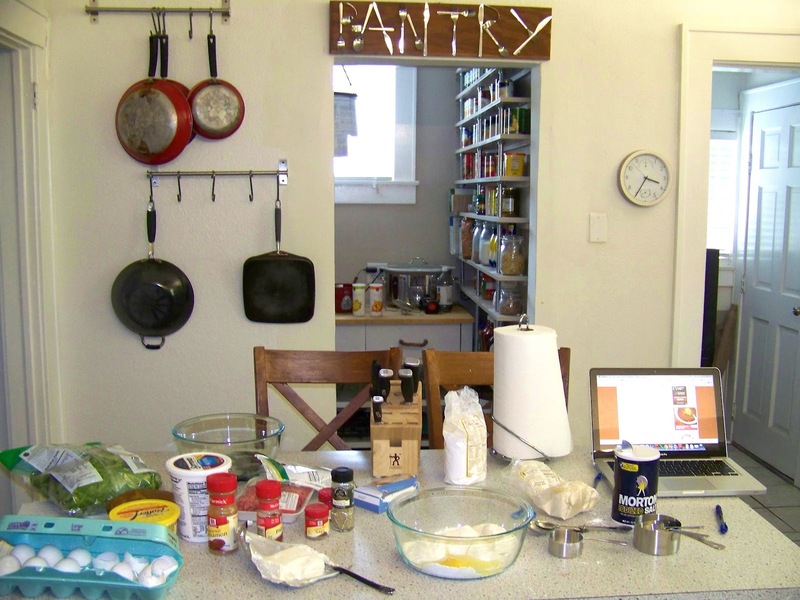 I'm pinning this, and I'll be back soon to invite you to Gluten-Free Mondays--a linky party I will be starting on my site: OneCreativeMommy.com. 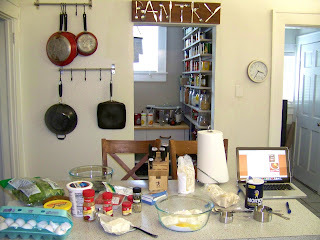 I am starting a Gluten-Free Share Page on OneCreativeMommy.com. Today was my first post. I would love it if you visited and linked up some of your great ideas. I don’t mind if they are free or if they are items to buy. We’re all looking for ideas! I hope to see you there.